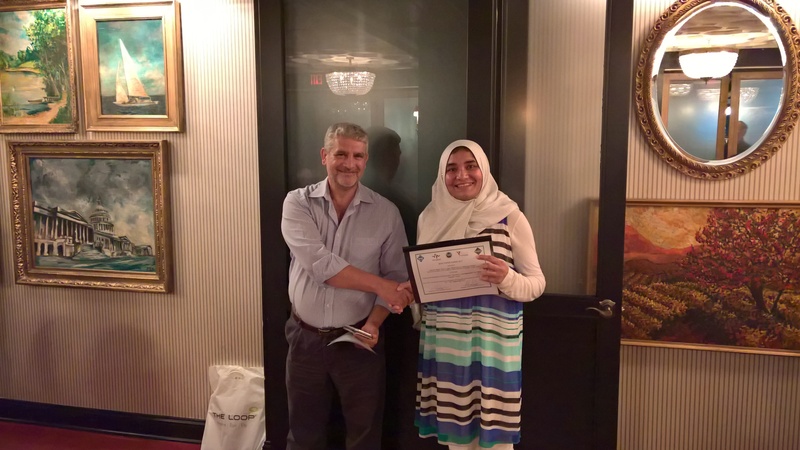 Graduate student Zahmeeth Sakkaff accepts the ACM NanoCom Best Paper Award. Last week students and faculty from the Department of Computer Science and Engineering received the ACM International Conference on Nanoscale Computing and Communication (NanoCom 2017) Best Paper Award. The paper, "End-to-End Molecular Communication Channels in Cell Metabolism: An Information Theoretic Study,” was written by computer science and engineering graduate students Zahmeeth Sakkaff and Mikaela Cashman, biochemistry graduate student J. L. Catlett, computer science and engineering assistant professor Massimiliano Pierobon and Susan J. Rosowski professor Myra Cohen, biochemistry associate professor Nicole Buan, and mathematics associate professor Christine A. Kelley. This paper was the result of a research conducted during an interdisciplinary collaboration with the university’s biochemistry and the mathematics departments, which was funded by NSF grants. Part of the research also came from Sakkaff’s master’s thesis, which was awarded 2017 Outstanding Master’s Thesis Award by the Department of Computer Science and Engineering. ACM NanoCom aims at fostering and reinforcing the research community contributing to new nano communications and computing paradigms. This is the first year that the conference has introduced Best Paper Awards. Two papers were selected for honors at the conference this year. In addition to the Best Paper Award, Saakaff received the 2017 Student Travel Grant Award to attend the NanoCom Conference this year. We congratulate all the students and faculty honored with these prestigious awards! The 2017 ACM NanoCom Best Paper Award that was presented at this year's conference so CSE faculty and students.